We’ve got another corker of a cake for May’s cake of the month. Its baker, Julia, is also a bit of a corker in our eyes, producing cake after imaginative cake for us. She is not a One Direction fan. She didn’t know the names of the boys in that band. But she became one and learnt their names for this project, and in doing so, we can imagine, made one Hackney birthday girl last month feel very special indeed. Thank you, Julia, for the dedication you show to the cause – having to Google Harry Styles is going above and beyond! 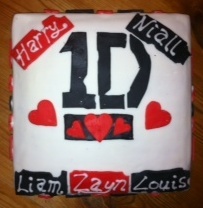 Name of cake: The Only Direction is One Direction! This was a standard Victoria sponge recipe with strawberry jam in the middle, covered with buttercream and rolled icing and topped with cut-out icing decorations and glace icing writing. •	Ready to roll icing – white for coating the cake and coloured red and black with colouring gel for the cut out decorations. I made one large square cake and when baked cut it in half and sandwiched it together with jam. 1. Heat oven to 190C/fan 170C/gas 5. Butter the tin. 2. Beat butter and caster sugar in large bowl. 5. Fold in the flour and baking powder (sifted together). 6. Pour the mixture into the tin and smooth. 7. Bake for about 20 mins until golden and the cake springs back when pressed. Turn onto a cooling rack and leave to cool completely. I live in Stoke Newington with my two children. I’m a family lawyer and mediator and now work in legal training. I really enjoy baking and especially the challenge of the special occasion cake. My kids have always loved having a birthday cake and usually I make something on a theme that they are particularly keen on that year or related to the theme of the party. This year my son had a Phoenix cake for a ‘Harry Potter’ birthday and my daughter had a Midsummer Night’s Dream cake. When I heard about the FCFK initiative I just thought what a brilliant and simple idea it was to match up people keen to make cakes (but don’t necessarily want to eat them!) with kids who would really appreciate a homemade cake, just for them on their special day. It’s been a lot of fun, working out what to make given the ideas that come from the kids or their carers.